While many 2FA and beyond methodologies implement SMS as a factor in authentication, I was uncomfortable sending factors over the wire. Over the years I have had one actual instance where a machine got rooted and the SSH private key (although passphrase protected) was stolen from said machine. At the time, I did not have PGP set up, so I had no way of getting a new key trusted by the FreeBSD community. We quickly blacklisted the stolen key and a review of recent commits was performed to check for any malicious activity. Another developer was sent to my house to verify government-issued ID before a new key was generated offline and injected into the cluster through a trusted channel. From that incident many years ago, I vowed to never let a single factor stand between me and the FreeBSD cluster again (that factor being a passphrase typed at a command-prompt to load an SSH private key that gave access to the FreeBSD cluster and commit access to change any FreeBSD source code). Since I was actively writing and maintaining the FreeBSD boot loader at the time, there was some mild concern that malicious code could have been injected into places that few others understood (the loader code that I write/maintain is in a language called Forth; a language which causes most to run the opposite direction and is known for being quite unreadable). I did a top-down review of every line of Forth at that time to put minds at-ease (added benefit, I then shortly after rewrote several of the inefficient structures and solved some inherited issues that were long-in-the-tooth as they say). Post-incident, my SSH private key to the cluster remained secured on a thumb drive encrypted by GELI — an in-kernel FreeBSD system that allows for the encryption of entire filesystems with a myriad of options. We went from a single-factor to 3-factor in a single day, but we will see how a scare later resulted in the development of 4- and 5-factor authentication that is used today. For many years I used 3FA implemented as a physical USB thumb drive kept in a secure location, offline, encrypted, holding SSH private keys protected with a unique passphrase. One day, it was believed that I lost this key. When it became obvious that we were not going to find it in any time soon, I had the cluster revoke my keys. This time, however, I had PGP properly set up and could quickly re-establish trust by sending a new public key in a PGP encrypted message to the cluster admin team. Every time I regenerate my FreeBSD.org private keys (years apart) I take the opportunity to think about security. This time I had an entire framework built around my 3FA solution, and I envisioned a scenario where the person that may have found my thumb drive would not be able to decrypt the contents even if they had stolen the passphrase through keystroke logging. My 4FA solution was born. Since FreeBSD GELI allows you to have multiple keys (which are essentially concatenated together to form one ginormous key), I built a new framework which creates a key (we’ll call this a trust certificate) for the host or hosts that you want to allow decryption. Thus, only if an attacker were able to purloin both my GELI passphrase using a keystroke logger and steal the GELI keyfile from trusted host will they be able to mount the volume. Those 2 factors plus the physical locality of the thumb drive (and being mostly offline), plus the passphrase required to use the SSH private key, altogether form 4FA. Where does the fifth factor come into play? Physically locking USB thumb drives that require a code to unlock before they will yield their plug to a computer. I have seen 3 such mechanical devices (e.g., the Cryptex Round Compass Lock by SDI) and a couple digital ones with a keypad/LCD on the thumb drive. The framework creates a FreeBSD slice to allow the creation of multiple encrypted partitions each with a different key and trust certificate. You can make a USB thumb drive that has 7 encrypted partitions, each with a different passphrase, and with the trust certificates for each partition sent to different people. The net effect would be a thumb drive that can be used by 7 people but each person can only open their partition. There are other hidden features, such as the ability to dynamically resize the encrypted slice (both grow and shrink) but you can also add 2 additional partitions to it for making it look like it’s just a drive for another OS with some random unencrypted data on it for TSA to peruse. 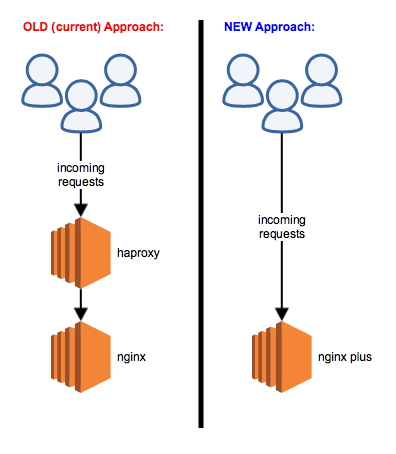 At $work, we have been looking at Nginx Plus because unlike the free open-source version of Nginx, Plus has load-balancing features. We’re pretty excited about that because it means we could potentially replace our reliance on HAProxy. Below is a simple graphic showing the potential infrastructure change. The next thing we had to do was determine which platform we would be using for our test of Nginx Plus. That ended up being limited to just two choices based on our constraints — must be physical hardware and must support HTTP/2 and ALPN. While the system requirements page doesn’t say this directly, we were informed that the only configuration currently supporting HTTP/2 and ALPN on physical hardware is FreeBSD 11.0 and Ubuntu 16.04 LTS. Others such as CentOS were disqualified because, for example, the OpenSSL version was too old to support ALPN. With a little bit of work in massaging our PXE server (resulting in a complete rewrite of pxe-config for FreeBSD deployment automation), we had the FreeBSD systems deployed in a matter of days. The generation of a Debian Installer preseed for Ubuntu proved to be far more time-consuming and challenging, but after a week we had the Ubuntu systems deployed as well. We then registered for a free 30-day trial of Nginx Plus and went through the installation instructions for each Operating System. The steps for FreeBSD and Ubuntu are similar wherein you configure your system to add their package server and use the standard package utilities (pkg on FreeBSD and apt-get on Ubuntu) to install a binary package. With FreeBSD 11.0-RELEASE-p1 and Ubuntu 16.04 LTS on identical servers in the same rack/switch, we were ready to do some benchmarking to help us determine whether Nginx Plus can deliver equitable performance in a load-balanced array compared with an haproxy cluster sitting in front of the free and open-source version of Nginx. -n  Number of requests to run. Default is 200.
be smaller than the concurrency level. Default is 50.
metrics in comma-separated values format. -H  Custom HTTP header. You can specify as many as needed by repeating the flag. For example, -H "Accept: text/html" -H "Content-Type: application/xml" . -t  Timeout for each request in seconds. Default is 20, use 0 for infinite. -D  HTTP request body from file. For example, /home/user/file.txt or ./file.txt. NOTE: Although our requirements include HTTP/2 and hey has the -h2 flag to enable HTTP/2, our performance benchmarks will be using HTTP/1[.1] because our current edge infrastructure to which we can make comparisons does not yet support HTTP/2. This asks hey to perform a total of 3000 HTTP/1[.1] GET requests for <url> with up to 300 concurrent requests. Focusing on the Summary Total, we can see that vanilla FreeBSD takes 3x longer than Ubuntu and something is causing high response times in FreeBSD. SPOILER: After much digging, it was discovered that the nginx binary for Nginx Plus was linking against an OpenSSL that was compiled from ports without the ASM optimizers (highly optimized Assembly routines for speeding up calculations on supported CPU architectures). 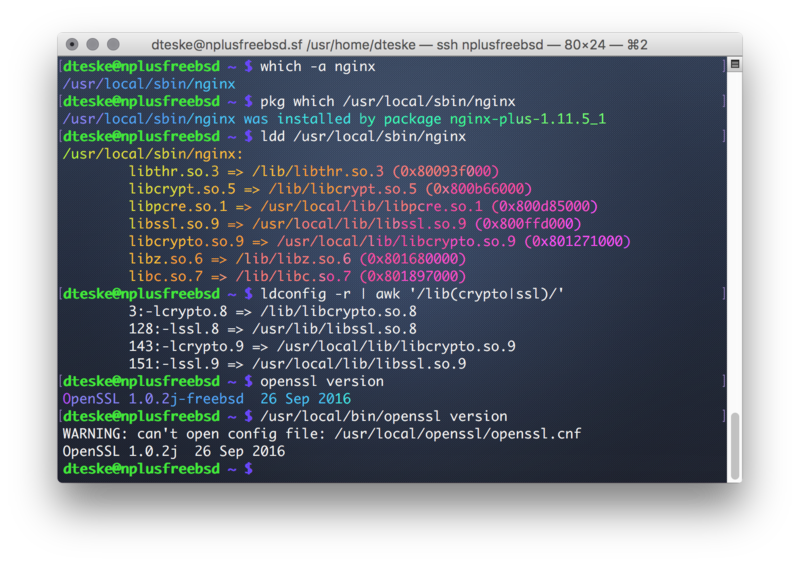 The instructions for installing Nginx Plus on FreeBSD include “pkg install nginx-plus” and this brings in security/openssl from ports instead of using the OpenSSL that comes with the FreeBSD base Operating System. This is generally a good thing because ports are updated more frequently than base which helps keep Nginx Plus up-to-date with the latest OpenSSL. However, as we will see in the below photo, both the system OpenSSL in /usr/bin and the ports OpenSSL in /usr/local/bin are the same version compiled on the same calendar day (despite having different shared library suffixes). Though the two versions of OpenSSL appear to be the same, they are actually quite different. When OpenSSL is compiled with ASM optimizations, it can take full advantage of AES-NI and PCLMULQDQ, two important CPU instructions that increase the efficiency of cryptographic calculations. The OPENSSL_ia32cap environment variable is a bit-mask of OpenSSL capabilities which allows us to disable AES-NI and PCLMULQDQ. Combining the values of ~0x200000000000000 (disable AES-NI) and ~0x200000000 (disable PCLMULQDQ) to get ~0x200000200000000, we can disable both AES-NI and PCLMULQDQ for individual runs of “openssl speed“. In the below two commands, if your CPU supports AES-NI and your OpenSSL has been compiled with ASM optimizations, the first command will be many times faster than the second (wherein optimizations are disabled if available). NOTE: See https://wiki.freebsd.org/SSHPerf for additional details. As one might expect, the OpenSSL in /usr/bin shows a huge performance increase when AES-NI is not disabled. 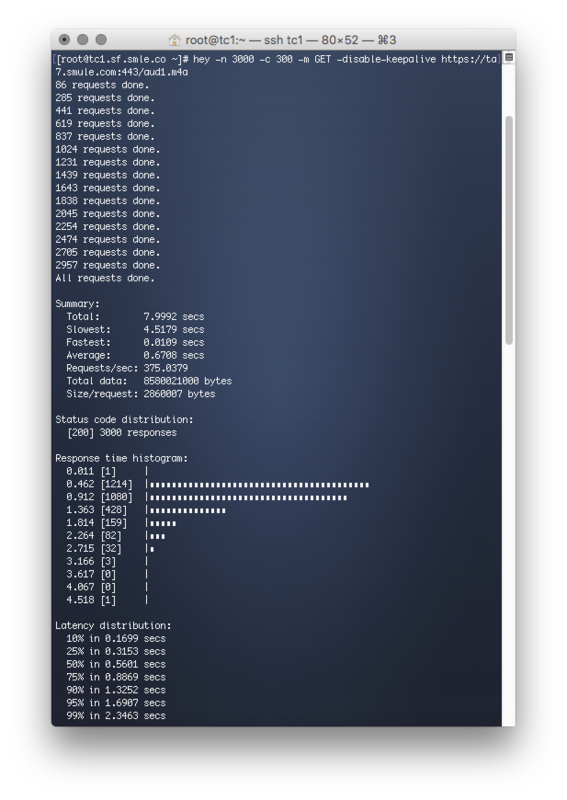 It was quite the shock to find that the ports OpenSSL in /usr/local/bin showed no differences in performance between the two commands. We, the FreeBSD committers, took a look at the security/openssl port and discovered that it did not enable ASM optimizations by default at the time the binary packages were last compiled for FreeBSD 11. So I worked with the maintainer of port to fix that for the next time the packages get recompiled. The next step is to determine the impact that an un-optimized OpenSSL has on our hey tests. The FreeBSD dynamic linker supports configurable dynamic object mapping through libmap.conf(5), so it is a fairly simple matter of telling /usr/local/sbin/nginx to use a different OpenSSL. After creating this file and restarting nginx with “service nginx restart“, the hey performance tests now show FreeBSD ahead of Ubuntu in a head-to-head test. To better illustrate the effects that the unoptimized OpenSSL had on the hey benchmarks, I wrote a utility that generates JSON from the output. NOTE: While there are many ways to benchmark, this test focused on “time to completion” for 3000 requests with up-to 300 concurrent. The JSON generated depicts the non-linear approach toward completion. # Statistics are logged to stdout. Use hey2graph to generate JSON. # JSON is designed for highcharts/highstock API. # Should we use Secure-HTTP (https)? printf "Usage: %s HOST\n" "$pgm"
echo "Performing $TOTAL total requests"
echo "Maximum $CONCURRENT concurrent requests"
The process of generating JSON graph data was performed for Ubuntu, FreeBSD with ports OpenSSL, and FreeBSD with base OpenSSL. As you can see in the below graph, FreeBSD with base OpenSSL is the fastest with Ubuntu very close behind, and FreeBSD with an unoptimized ports OpenSSL coming in at 3x slower. Satisfied that we had eliminated the performance issue causing FreeBSD to be 3x slower, we now asked why is Ubuntu slower than FreeBSD? Intensive throughput benchmarks showed that FreeBSD is capable of reaching 87.1% line-rate while Ubuntu was only capable of 86.5%. Both systems given an Intel 10GE network interface, FreeBSD appears to be utilizing the hardware more efficiently. At the switch, we can see that FreeBSD is 99.1% efficient on 10GE, resulting in a measured 10.3% TCP overhead at the time of testing. The result of our testing is that FreeBSD running Nginx Plus is a suitable replacement for our HaProxy and Nginx topology. You and everyone reading this won’t have to worry about the documented issue with OpenSSL because I worked with Bernard Spil and Allan Jude to get it fixed in the FreeBSD ports tree. The security/openssl port has been updated to enable ASM optimizations by default and fairly soon the binary packages will be rebuilt — until then, you can use the above /usr/local/etc/libmap.d/nginx.conf file to temporarily use the base OpenSSL if you’re unable to update /usr/ports/security/openssl/Makefile and recompile it yourself. For work, I have been given a new Macbook Pro 13″ running Mac OS X version 10.11.6, also known as El Capitan. However, things have changed slightly in El Capitan, so we’ll explore a new set of instructions to simplify the process. As the only release engineer at $work, I have been tasked with creating the bootable USB devices of our FreeBSD-based product to send to the Contract Manufacturer. Every time a new release made it to General Availability (GA) status, Sabine would drop off a couple USB sticks and tell me which build to load onto them. Wanting to empower her, I set out to create a better approach; one that did not involve dropping to the command-line and tapping-out a “dd” command. Meet a new AppleScript, named “WriteImage” written to take the guess-work out of the process. 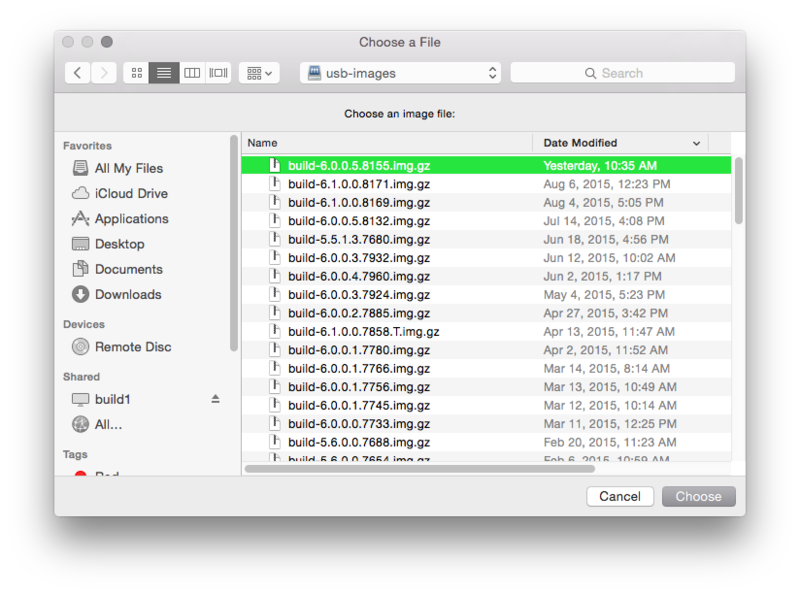 With WriteImage you can now take the USB image file (*.img or *.img.gz) and drop it on the AppleScript droplet. It automates the process of generating the necessary commands to image the file onto hardware USB. Tell the app through a series of clicks or drag/drop actions which image to write, it then prompts you to insert a USB device, and then asks for confirmation (twice) before launching Terminal to do the dirty work. WriteImage initial dialog when double-clicked. WriteImage prompt, waiting for you to insert a USB device to image. 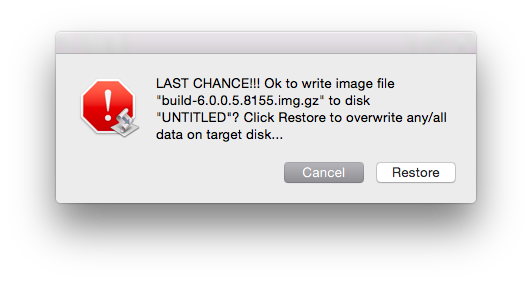 WriteImage displays a Last Chance dialog before proceeding to do anything. WriteImage runs a shell script that does the dirty work. 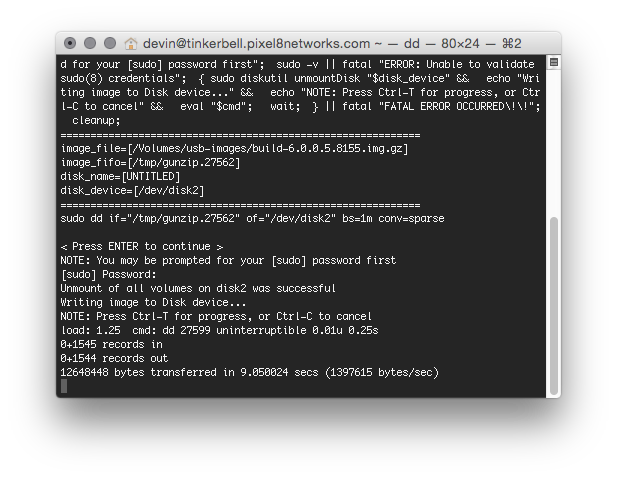 As-is the case with FreeBSD images, when the process is complete, your Mac will give this error. Success in disguise. 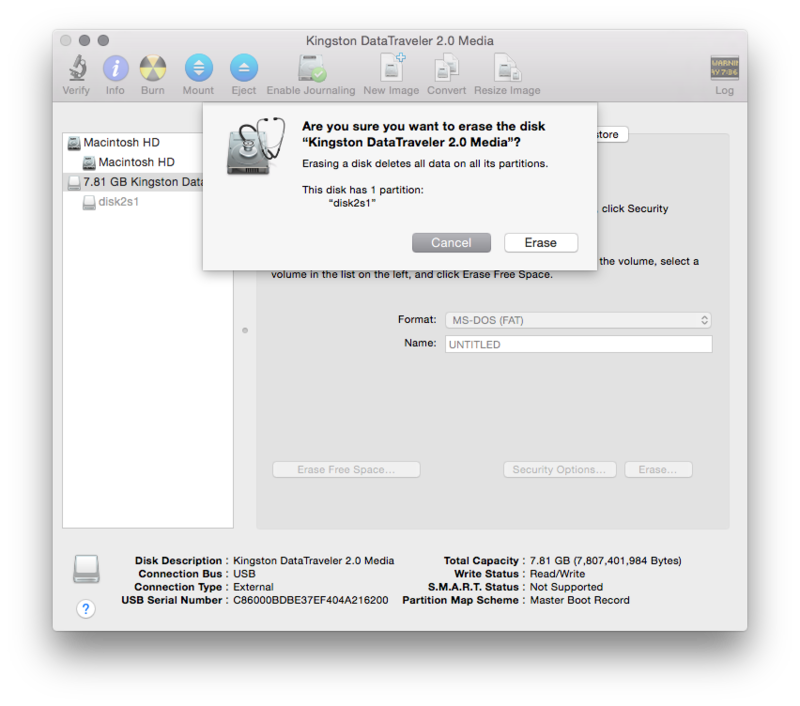 Having recently updated my 2014 Macbook Air 11″ from Mac OS X 10.10 to 10.10.4, I lost my customizations to Apple’s OpenSSH and no longer was I receiving anything in the Notification Center for SSH logins using my keychain. Looks like it’s time to rehash the steps necessary to reload support for the Notification Center for those going through the same ordeal. Step-by-step we’ll go through the motions of re-obtaining the latest copy of Apple’s modified OpenSSH, to be patched. NOTE: Make sure you’ve updated Xcode in Apple Software Update, else you’ll get the error "configure: error: Your OpenSSL headers do not match your library" during compilation steps below. ASIDE: You can browse Apple’s opensource repository at https://opensource.apple.com/ (obtaining the latest copy of OpenSSH with Apple’s customizations couldn’t be easier). Rather than documenting how to navigate said page, below steps will instead use direct links to the software we’re recompiling (for brevity). Now every subsequent ssh request will give you a notification in Apple's built-in Notification Center. Cheers! 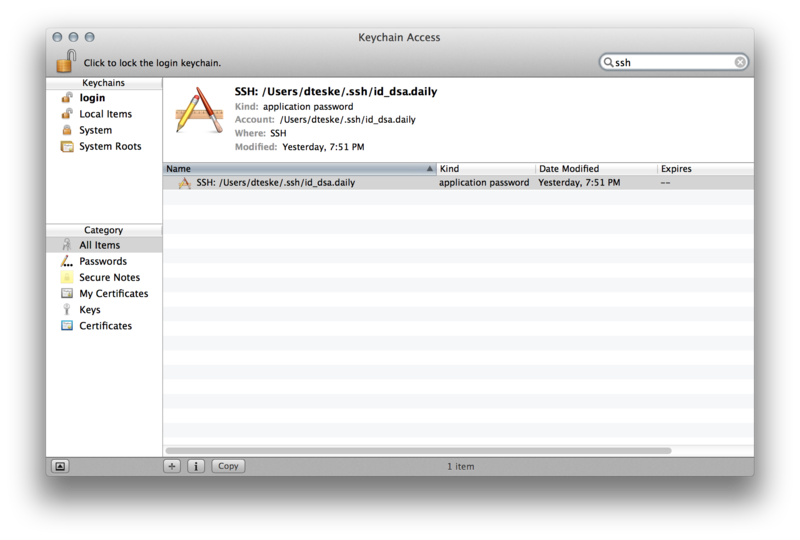 Apple has integrated launchd(8) and Keychain support into ssh-agent(1) so it launches automatically on-demand and can interact with keys stored in Keychain Access. First, a brief look at the above integration before we go improving things using new features introduced in Mac OS X 10.8 and higher. EDIT: If you’re reading this thinking “Mac OS X has had Keychain and launchd integration for a while,” skip on ahead to “That being said…” below). which both loads your key into the running ssh-agent(1) and imports it into your Keychain. So you’ll find that quite untraditionally if you kill the running agent and then try to ssh(1) to a remote host, a new agent is launched on-demand and it loads the private key through the Keychain (login succeeds despite conventional logic about agents). If you delete this key from Keychain Access application then ssh(1) logins requiring that key no longer succeed as the running agent immediately loses access to said key. 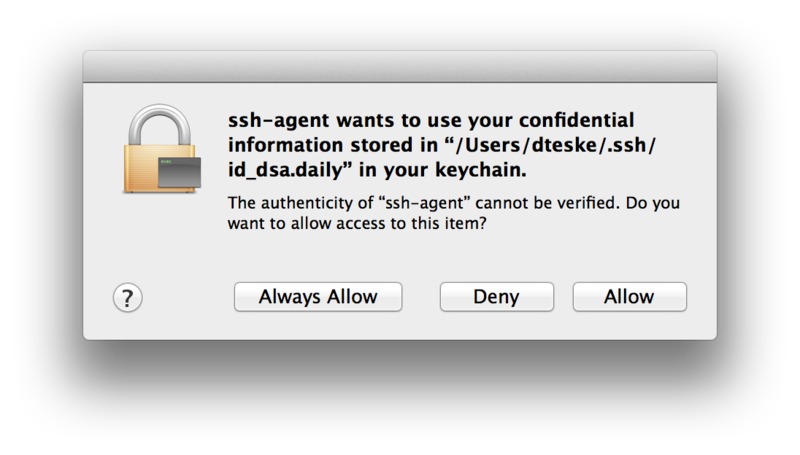 So the Keychain can be thought of as a persistent store for the agent; one that is tied to your Mac’s login account. The automatic re-launching of ssh-agent(1) through launchd(8) means that if you kill the running agent it will be re-launched not immediately but only when access is attempted to a launchd(8)-provided default $SSH_AUTH_SOCK value as-configured in /System/Library/LaunchAgents/org.openbsd.ssh-agent.plist. To find a running instance of “/usr/bin/ssh-agent -l” (the “-l” indicating it was launched on-demand by launchd(8)). This is all very slick integration that quintessentially eases your SSH life. In a nut-shell, it’s private keys provided from your Keychain on-the-fly whenever you use an ssh utility. That being said, we can certainly improve upon this integration by adding new code to Apple’s version of OpenSSH. Primarily, since ssh-agent(1) can now be loaded on-demand and access data in my Keychain, I would like to get a notification every time someone uses the running agent (for security reasons and also coolness factor). In Mac OS X Mountain Lion (10.8) and Mavericks (10.9) we are blessed with the new Notification Center API (http://support.apple.com/kb/ht5362). This built-in functionality replaces the need for 3rd-party software such as Growl (http://growl.info) required to perform notifications in previous releases of Mac OS X (10.7 and older). RESOURCE: Apple’s custom version of OpenSSH (available from http://opensource.apple.com — specifically for Mavericks http://opensource.apple.com/tarballs/OpenSSH/OpenSSH-186.tar.gz). EDIT: My friend just made a patched version of Simon G. Tatham’s Pageant that provides native Windows notifications — http://www.twitpic.com/e2v52x/full — available in both Source (https://github.com/gdestuynder/putty-pagent-notification) and binary release (https://github.com/gdestuynder/putty-pagent-notification/releases). However, my good friend’s work was on the non-Apple version of OpenSSH and thus my resulting agent binary lacked launchd(8) integration and Keychain support. This meant that if I were to replace the existing /usr/bin/ssh-agent binary in Mavericks with the patched non-Apple version, I would lose those features previously discussed above, let alone that his patches were for an external notification system versus the new built-in Notification Center. So I set out to build a drop-in replacement for Mavericks’ /usr/bin/ssh-agent carrying all the integration of the original. 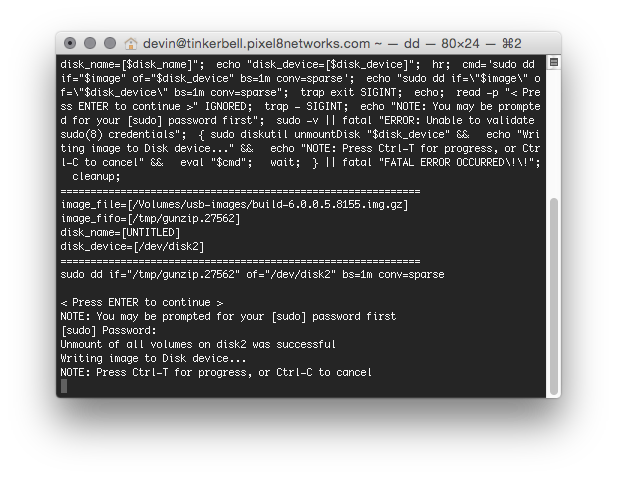 EDIT: Keep reading toward the end for GitHub source link and link to Mavericks binary. After unpacking Apple’s OpenSSH-186.tar.gz (link above) and applying my patches to add support for NSNotificationCenter, I quickly learned that some additional non-standard configure arguments were required. Granting patched ssh-agent(1) access to Keychain for the first time. I choose the “Always Allow” option, knowing that if I want to change it later I can locate the private key in Keychain Access (HINT: Filter on “ssh”) and press the Command-I keyboard shortcut to edit Access Controls for that key. My patched agent is programmed to hook into the new Notification Center and send you a notification when signing requests (image below). Now every time I authenticate by way of private key, regardless of whether that key was loaded once with “ssh-add” or from the Keychain imported via “ssh-add -K“, I get a message from the Notification Center. EDIT: The primary concern that inspired this work is when you enable agent forwarding to remote hosts. Logging into a compromised host with agent forwarding, a hacker can use your agent to log into yet uncompromised systems to which you have access via your agent. While notifications won’t prevent the use of your agent to reach new machines should you enable forwarding through a compromised system, the notifications will let you know when to (a) shut down your agent (b) take inventory of active connections where agent forwarding was enabled and (c) cull the logs for machines you were forwarding through in an effort to find suspicious activity indicating either a malicious hacker or black-hat administrator on the system. For a corporate laptop that primarily only ever connects to corporate networks (where such activity is never to be expected), a notification is more than adequate to quell the problem (versus a public network where it may be more advantageous to use an ask-pass utility to confirm key usage rather than notify after open usage). How those messages appear are configured in the System Preferences for Notifications (easily accessible via the gear icon at bottom-right of the Notification Center Drawer). Only after you’ve received your initial message from the patched ssh-agent(1) can you then configure the specifics of how its messages appear. The patched agent pretends to be Keychain Access when talking to the Notification Center, so configuring the style and attributes for Keychain Access notifications will allow you to customize how these agent notifications appear. As notifications are delivered, they stack up in the pull-out drawer of the Notification Center. I like to clear the log of ssh-agent(1) notifications before I go to bed and check for any when I wake up (perhaps indicating that my agent signed a login request when I wasn’t looking). But you don’t have to modify the code if all you want to do is disable the notification sound. Within the Notifications section of System Preferences you can state that you don’t want the Keychain Access notifications to play a sound. Executing these 5 commands and then logging into a remote machine with ssh(1) using private keys should generate a notification from Keychain Access (pictured above). Cheers! Wherein your next ssh(1) command will cause the original ssh-agent(1) to be loaded (which doesn’t support NSNotificationCenter API). I recently found my FreeNAS box rebooting itself in the middle of the night (every night) and I wanted to know what was going on. I first tried enabling the debug kernel (see below picture) but that didn’t work nor did it get me any closer to understanding the issue at-hand. The idea behind enabling the debug kernel was that it would drop me into the kernel debugger rather than rebooting 15 seconds after an unattended fatal error (leaving zero logs to analyze). But much to my surprise, the system rebooted anyway. 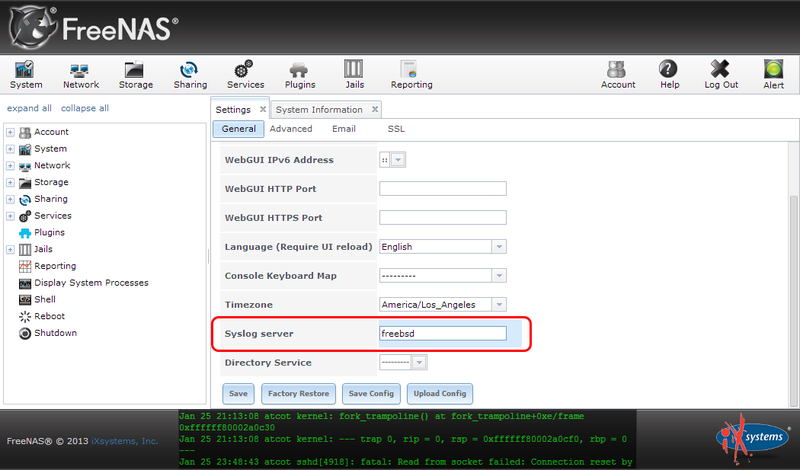 The next step was to set up remote syslog to allow FreeNAS to log to an external box. The first thing I did was connect my FreeNAS server directly to a FreeBSD system. The FreeNAS system will be configured to log everything to the FreeBSD system; so when FreeNAS reboots I will have a log of what lead up to that event. I configured the secondary network interface on each server to talk on the same subnet. 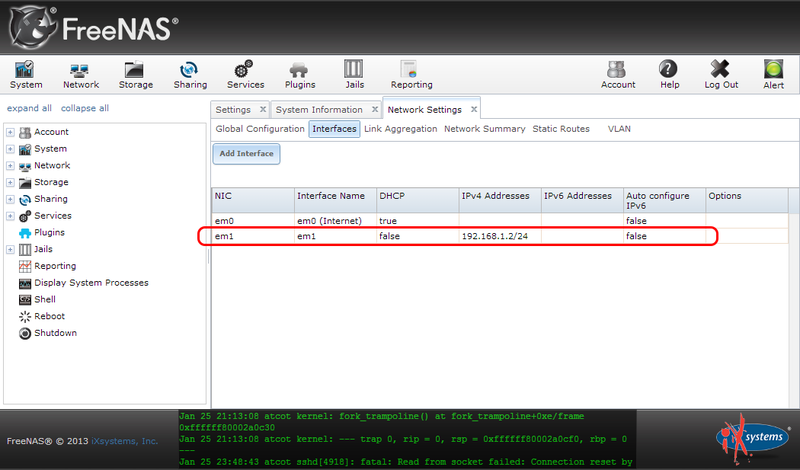 On the FreeNAS side, I went into the WebUI and configured the second interface of em1 to have IPv4 address 192.168.1.2 with a /24 subnet (255.255.255.0). When that was done, it looked like the below picture. After that, I logged into my FreeBSD server and prepared it to receive remote syslog data. sysrc syslogd_flags="-a freenas -v -v"
Then perform the last final bit, which is to go into the FreeNAS WebUI and enter a value of “freebsd” for the syslog server (see below picture). Of course, the jury is still out on exactly why my system is crashing, but I suspect a failing hard disk (the logs being streamed to the FreeBSD system seam to indicate via smartd messages a prefail condition for the boot disk). 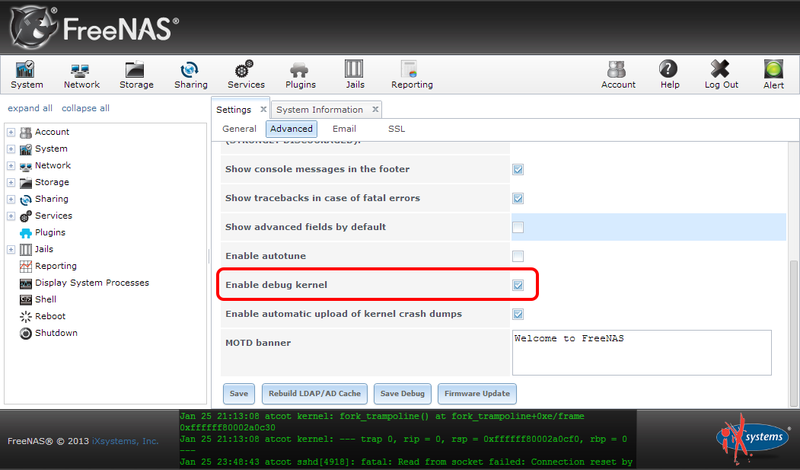 If you should find that you have a FreeNAS system for which you have forgotten the root password, here’s an easy way to recover your system. First, you’ll need to get shell access. If you’ve left the console menu enabled, then resetting the root password is as easy as 1, 2, 3. However if you have disabled the console menu for security reasons, keep reading for the prescribed recipe. If you are lucky enough to have a user on the system that has sudo privileges, the first step is to log in as that user. If you do not have such a user, the first step is instead to boot into single-user mode. TIP: Since FreeNAS has a 1-second timeout on the boot menu, you’ll have to repeatedly tap the space bar when you see it starting to load the kernel; with perseverance you will be able to abort the 1-second timeout to interact with the boot menu wherein single-user mode can be enabled. This is only the first step on a FreeNAS system. The work done by the above command will be undone by the /etc/ix.rc.d/ix-passwd boot script every time the machine boots. We need to take the temporary work performed by the above command and make it permanent by copying the information into the FreeNAS SQLite accounting database. …to continue booting. If instead you used a sudo capable user to make the change, there is no need to reboot as the system accounting table in the FreeNAS SQLite database is in-sync with the FreeBSD system accounting files (/etc/master.passwd; /etc/spwd.db; etc.). You should now be able to log into the FreeNAS WebUI with the updated password. Cheers!